The Maya Pax group singing in Maya at Chunux RC school. Corozal District . Belize. Senor Roy Rodriguez Sr.. Senora Adela Pederson. Senor Faustino Yam. Senor Adan Palomo. Miss Michelle Guevara. Senora Aracelie. Officially recognized as a group focused on its objectives. The organization "Toone Masehualoon" is an NGO (Non Governmental Organization) in Belize Central America. 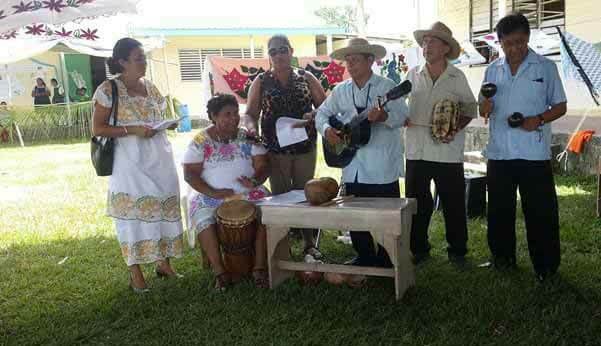 It is organized to preserve and to promote the rich maya culture in northern Belize by focusing on the rescue and preservation of the Yucatec Maya language, the maya culture, spirituality, traditions, dances and ancient story telling. The aim is to recapture and embrace once more the pride and distinction of being of maya heritage and ancestry in beautiful Belize. Directors of this group are: President: Ms. Adela Pederson, Vice President Mr Roy Rodriguez Sr., Treasurer: Mr Faustino Yam and Secretary: Mr Adan Palomo. Active members: Dr. Barbosa, Michelle Guevara and Aracelie. Thank you for your dedication and support to this vital cause. Yuumbotic.